April 23, 1985, stands as one of the most significant dates in business history — the date the 99-year-old Coca-Cola company announced it was scrapping its original soda formula for a newer, sweeter version. 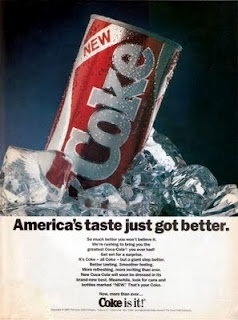 In blind taste tests, consumers generally preferred “new Coke” over the original drink and competitor Pepsi, but the company severely underestimated the nation’s sentimental attachment to the iconic American brand. After being flooded with phone calls, 40,000 letters and reams of bad press, the company backtracked three months later, announcing the return of Coca-Cola “classic”. Sales for the original Coca-Cola surged, restoring it as the dominant leader in the nation’s competitive soda market. The reviled replacement drink stuck around and was later rebranded “Coke II” before eventually fading away.